BYRON, GEORGE GORDON, 6TH LORD BYRON (1788-1824). —Poet, was born in London, the son of Captain John Byron and of Catherine Gordon, heiress of Gight, Aberdeenshire, his second wife, whom he married for her money and, after squandering it, deserted. He was also the grand-nephew of the 5th, known as the "wicked" Lord Byron. From his birth he suffered from a malformation of the feet, causing a slight lameness, which was a cause of lifelong misery to him, aggravated by the knowledge that with proper care it might have been cured. After the departure of his father his mother went to Aberdeen, where she lived on a small salvage from her fortune. She was a capricious woman of violent temper, with no fitness for guiding her volcanic son, and altogether the circumstances of his early life explain, if they do not excuse, the spirit of revolt which was his lifelong characteristic. In 1794, on the death of a cousin, he became heir-presumptive to the title and embarrassed estates of the family, to which, on the death of his great-uncle in 1798, he succeeded. In 1801 he was sent to Harrow, where he remained until 1805, when he proceeded to Trinity College, Cambridge, where he read much history and fiction, lived extravagantly, and got into debt. Some early verses which he had published in 1806 were suppressed. They were followed in 1807 by Hours of Idleness, which was savagely attacked in the Edinburgh Review. In reply he sent forth English Bards and Scotch Reviewers (1800), which created considerable stir and shortly went through 5 editions. Meanwhile, he had settled at Newstead Abbey, the family seat, where with some of his cronies he was believed to have indulged in wild and extravagant orgies, the accounts of which, however, were probably greatly exaggerated. In 1809 he left England, and passing through Spain, went to Greece. 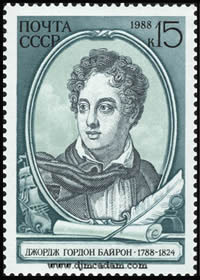 During his absence, which extended over two years, he wrote the first two cantos of Childe Harold, which were published after his return in 1812, and were received with acclamation. In his own words, "he awoke one morning and found himself famous." He followed up his success with some short poems, The Corsair, Lara, etc. About the same time began his intimacy with his future biographer, Thomas Moore, and about 1815 he married Anne Isabella Milbanke, who had refused him in the previous year, a union which, owing to the total incompatibility of the parties, and serious provocations on the part of Byron, proved unhappy, and was in 1816 dissolved by a formal deed of separation. The only fruit of it was a daughter, Augusta Ada. After this break-up of his domestic life, followed as it was by the severe censure of society, and by pressure on the part of his creditors, which led to the sale of his library, Byron again left England, as it turned out, for ever, and, passing through Belgium and up the Rhine, went to Geneva, afterwards travelling with Shelley through Switzerland, when he wrote the third canto of Childe Harold. He wintered in Venice, where he formed a connection with Jane Clairmont, the daughter of W. Godwin's second wife. In 1817 he was in Rome, whence returning to Venice he wrote the fourth canto of Childe Harold. In the same year he sold his ancestral seat of Newstead, and about the same time published Manfred, Cain, and The Deformed Transformed. The first five cantos of Don Juan were written between 1818 and 1820, during which period he made the acquaintance of the Countess Guiccioli, whom he persuaded to leave her husband. It was about this time that he received a visit from Moore, to whom he confided his MS. autobiography, which Moore, in the exercise of the discretion left to him, burned in 1824. His next move was to Ravenna, where he wrote much, chiefly dramas, including Marino Faliero. In 1821-22 he finished Don Juan at Pisa, and in the same year he joined with Leigh Hunt in starting a short-lived newspaper, The Liberal, in the first number of which appeared The Vision of Judgment. His last Italian home was Genoa, where he was still accompanied by the Countess, and where he lived until 1823, when he offered himself as an ally to the Greek insurgents. In July of that year he started for Greece, spent some months in Cephalonia waiting for the Greeks to form some definite plans. In January, 1824, he landed at Missolonghi, but caught a malarial fever, of which he died on April 19, 1824. The final position of Byron in English literature is probably not yet settled. Yet his energy, passion, and power of vivid and richly-coloured description, together with the interest attaching to his wayward and unhappy career, must always make him loom large in the assembly of English writers. He exercised a marked influence on Continental literature, and his reputation as poet is higher in some foreign countries than in his own.